Fender today released the new Albert Hammond Jr. Stratocaster. The Strokes guitarist's signature model features his own customized pickups switching: pickup switch position four activates the neck and bridge pickups in tandem, while positions one and three are reversed from the traditional layout. Hammond’s signature graces the back of the large Seventies-style headstock, while other Seventies-inspired features include a bullet truss rod nut, a 3-bolt “F”-stamped neck plate with period-correct Micro-Tilt adjustment and a Seventies-era logo. 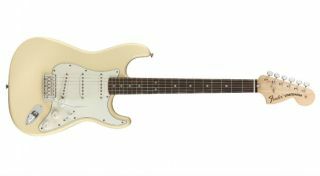 The Fender Albert Hammond Jr. Stratocaster is available for $874.99. For more information, head over to fender.com.